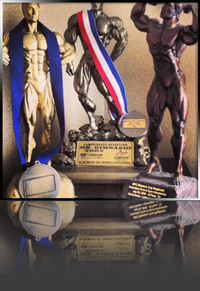 Personal Trainer Services by Kinetix Personal Training & Sports Nutrition - El Paso, TX. Personal Trainers for El Paso, TX. Kinetix Personal Training & Sports Nutrition is a readily available personal trainer service conducted by myself, Ricardo C. DeBello. I am a Certified PT, SNS with more than 17 years training experience as well as NPC National Level & NABBA Mexico Bodybuilding experience. I’m here to dedicate myself to helping you reach your personal health and fitness goals. My goal is to empower you with the knowledge, drive and discipline to take control of your own health and fitness. Kinetix Personal Training is not only a Personal Training service which includes One on One training, Aquatics, Military Boot Camps, Group Fitness and Competition Preparation but also under the same umbrella provides Online Personal Training Services and Vegan Meal Prep Services. We make every effort to ensure we cover a variety of areas that improve your quality of life in a health and fitness sense under one name; Kinetix. Kinetix Personal Training offers Integrated Training Programs, which are proven fitness based approaches consisting of flexibility, cardiovascular endurance, core, power, isolation, strength and resistance training. Incorporating these components in every individualized program involves functional strength, neuromuscular efficiency and dynamic flexibility. For your FREE Consultation, Fitness Assessment and Body Analysis Composition please call to schedule. 915.801.1841 or click HERE to schedule on the Online Calendar. Instruct, train and guide clients in the utmost professional, individualized and personable manner utilizing all resources and experience in order to achieve client goal(s) in a challenging and enjoyable training environment. Men’s Lightweight | Novice| 1st Place | 2005 | El Paso, TX. Men’s Lightweight | Novice| 1st Place | 2005 | Cd. Juárez, CHIH. Men’s Lightweight | Novice| 2nd Place | 2005 | Cd.Juárez, CHIH. Men’s Lightweight | Open | 5th Place | 2005 | El Paso, TX. Men’s Lightweight | Open | Placed | 2015 | El Paso, TX. Make a difference in your life by knowing what lies within you!